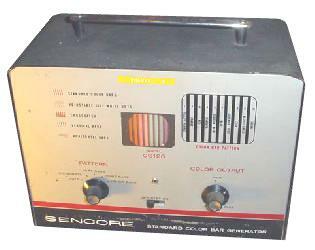 The CG-126 is a 9-tube television VHF generator that produces various selectable test patterns for any analog TV as an aid in troubleshooting video problems or alignment. The test patterns have a dark gray background with various white bar patterns including vertical rows, horizontal rows, crosshatch bars, or dots. The final selection creates color bar patterns for color TV.